Why Nifty Support is around 4700? Every broking house will have Nifty support levels around 4700 but very few broking houses will explain why the support for Nifty is around 4700 and what could be an action item for your investment objective. Let me first try to explain why there is strong support for Nifty around 4700 and an expected roadmap ahead with action items for each type of investment objective. Why Nifty Support is at 4,700? Let us first look at the Daily Nifty chart for last few months. Let us observe the chart of Nifty for last few months. We see a low of around 4,750 on 26th September, which was above the August low of 4,720 indicating W formation or a double bottom formation. This clearly suggests strong support for Nifty’s around 4700. Very detail explanation of understanding double bottom or W bottom is in Chapter 12 of my Technical Analysis eBook. We already know from Signals of Market Crash that Nifty has a strong resistance around 5200. 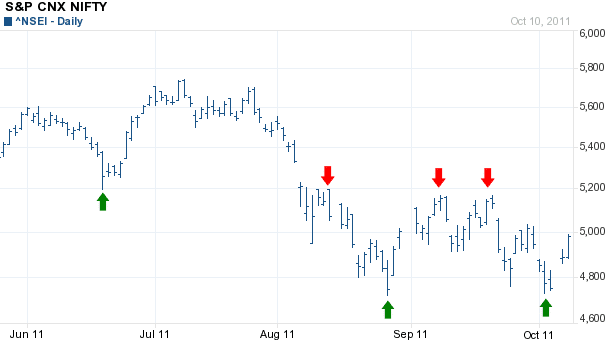 I have shown the same here again in the above chart with red arrows. Nifty has support around 4700 and resistance around 5200 and so according to me this should be the range for the nifty for next few trading sessions and Nifty should consolidate for a elongated period of time in range of 4800-5200. Depending on the news flows, RBI action and inflation number we may either see a breakout or break down. Important point to note here is – Don’t assume either breakout or breakdown. Let them happen and then go for it unless you know how to play the anticipated trades. I expect more positive news on the back cooling OIL in the world market but the bad news will be on the result front where some companies can miss on the result expectation – giving Nifty a tight range. Depending on your investment objective you need to play the market. Investors can buy around the support zone of Nifty i.e. around 4,700 and 4,800. Positional long traders can initiate long positions around 4,800 with stop loss at 4,680. Positional short sellers can initiate short positions around 5,150 with stop loss at 5,250. If you are not a Nifty trader, you can still invest in stocks that have similar kind of support formation in a downtrend or have already shown a breakout above the resistance level. What is your view for the Indian Market? Share your views in comments below. You are here: Home / Indices / Why 4700 is Nifty Support and What to Expect From Market Ahead?